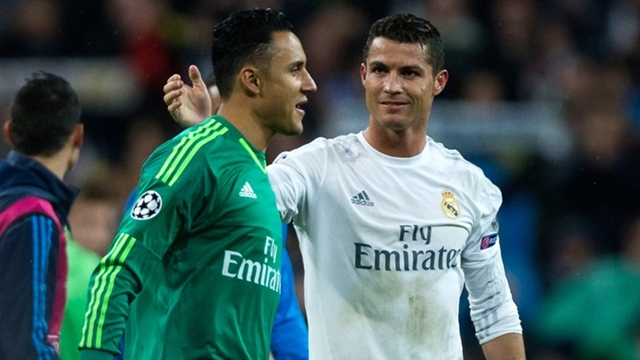 Real Madrid goalkeeper Keylor Navas admitted the La Liga giants are missing Cristiano Ronaldo after their goalless run continued on Tuesday. Madrid suffered a shock 1-0 loss to CSKA Moscow in the Champions League, extending their winless and goalless streaks to three matches. Ronaldo left Madrid for Juventus in July, having scored at an incredible rate at the club, including 44 times last season. While Navas is keen to move on from the Portuguese superstar, he said his team had a big hole to fill following Ronaldo's departure. "Cristiano left the bar very high at Real Madrid," he said. "You cannot cover the sun with a finger. "He made many goals while he was here, but it's already the past and we cannot live in the past." Nikola Vlasic's second-minute goal was enough for CSKA, who moved onto four points and top of Group G.
It marked the first time since 2007 that Madrid have failed to score in three consecutive games, while they hit the woodwork three times in Russia. Navas said: "We are sad because they had one chance and took it. "We made some stellar chances, but could not get it in. In every game you want to score goals and we had some chances to do so. We were unlucky. "We want to start scoring again in the coming games." Madrid get a chance to return to winning ways before the international break when they visit Deportivo Alaves on Saturday. Los Blancos return to Champions League action later this month against Viktoria Plzen. There has been no response to "'You can't cover the sun with a finger' – Navas admits to Madrid missing Ronaldo"